If you're like me, everyone in your circle of friends and family knows you love plants. Which means you probably receive a lot of seasonal plants for gifts! Over the years I have gotten some of the most amazing poinsettias, paperwhites, evergreen bushes and even a rosemary topiary shaped like a Christmas tree! A few years back my cousin gifted me with a beautiful red amaryllis. 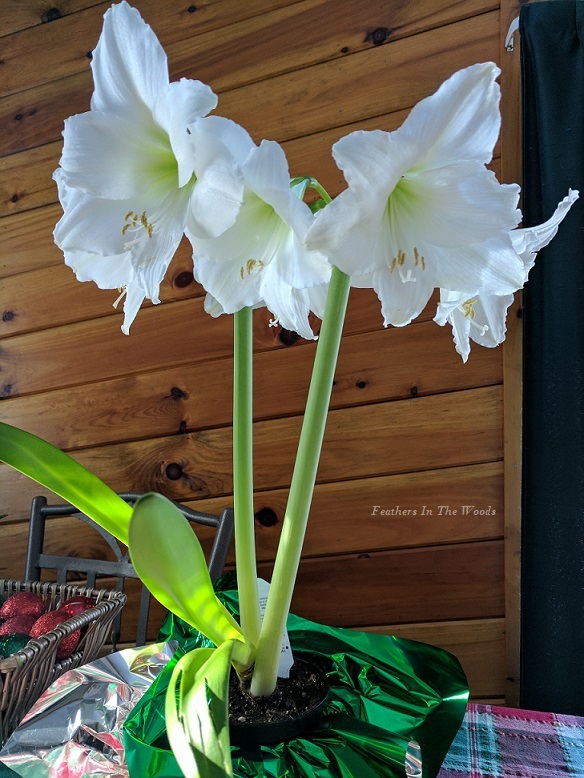 It bloomed right at Christmas time and had 2 flower stalks with 3 gorgeous blooms each. When she gave me the amaryllis (Amaryllis belladonna) she said something quite bizarre (at least to me). She told me "Sadly these are only good for one Christmas. Just like poinsettias." I told her not to worry, I'd figure out how to make it bloom again. After all, I turn my poinsettias red in time for Christmas every year. I figured out how to make my Christmas cactus bloom often. I can definitely figure this out! A few weeks after the holidays were over, my plant drooped over and all the leaves dried up. I plucked them off but continued to water the bulb. Shortly after, it started to sprout again. The leaves grew just as tall and beautiful as before with one exception. No flower stalk. I had done some research though and knew this was normal. I kept it in a sunny windowsill and allowed it to grow all spring and summer, watering regularly and fertilizing every few weeks. As fall approached I moved it out of the window and stopped watering it. The leaves died. I let it rest awhile. It was probably about 6 weeks. One day I noticed new growth emerging. I moved it into a sunny window and watered it. It bloomed again in time for the holidays. That was the whole process. I have since done this every year to have amaryllis blooms for the holidays! Amaryllis are so pretty and so easy to force blooms each year, that I now have several in both red and white! After blooming, cut back the flower stalk. Place in sunny window and allow foliage to grow again. Keep watered so soil is slightly damp, not wet. Feed every 3 weeks. I used compost tea. Stop watering the first of October. Move out of sunny spot and allow foliage to die off. Keep in cool, dark area until you see a flower stalk start emerging. Move back to the sunny window and resume watering. Continue watering through blooming and start the process again after. After the flower stalk starts to grow, turn the plant every few days so that the sun hits the opposite side. This will keep the stalk growing straight. 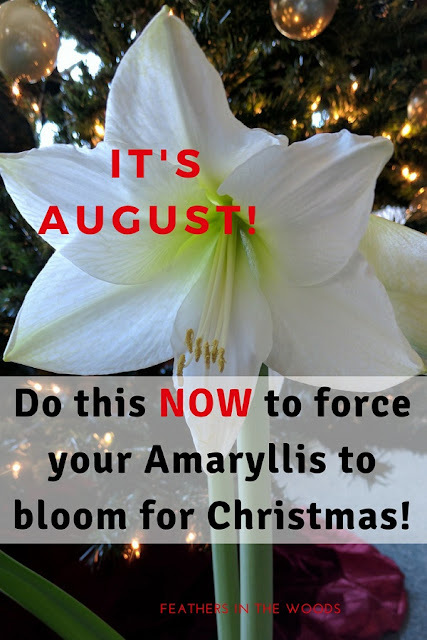 You can put your amaryllis outside in spring and bring it back in before the first frost. It prefers partial shade. Do not trim the leaves back in spring and summer. They need the leaves to grow so the amaryllis bulb can store energy for the dormant phase. Some people like to remove their amaryllis from the pot and store it bare root during it's dormant phase. They claim it produces better blooms when forcing an amaryllis to bloom for Christmas, but it made no difference when I tried it. The dormant phase is the main step in forcing your amaryllis bulb to rebloom. Don't feel like you're neglecting it, it need this rest time. So now you're wondering "Well, Lisa if I was supposed to start this in August why didn't you tell me then?" Well, I needed to get a picture of one of my amaryllis's in it's 'going dormant' stage and that just happened. Totally forgot to take one last year...sorry about that! However, if you happen to have kept an amaryllis bulb from last year it probably is pretty close to this stage anyway, so just quit watering it until you see that flower spike start to shoot up and you'll be fine! It might rebloom a little late for Christmas, but amaryllis don't seem to work on exact time tables....so you never know. Amaryllis come in many colors. Around Christmas most stores sell only white and red (that's all I've ever found). You can order other colors online. When choosing a pot to plant your amaryllis bulb in, choose a pot less then twice the diameter of the bulb. Allow 1/3 of the bulb to be above the soil. I'm the kind of person that can (and has) kill a cactus, so I don't dare try this. But if I ever manage to turn my black thumb green, then I'll definitely be giving this a try! Thanks so much for sharing at the #happynowlinkup! This is so good to know. I often get given an Amaryllis at Christmas and have had success with the first lot of blooms but never managed any more. Pinning just in case I get one this year! Wow! That is incredible. I have a black thumb myself and don't have the kind of instinct you have, but am inspired by this. Thanks for sharing!